They saved Ojai. That’s the short version. 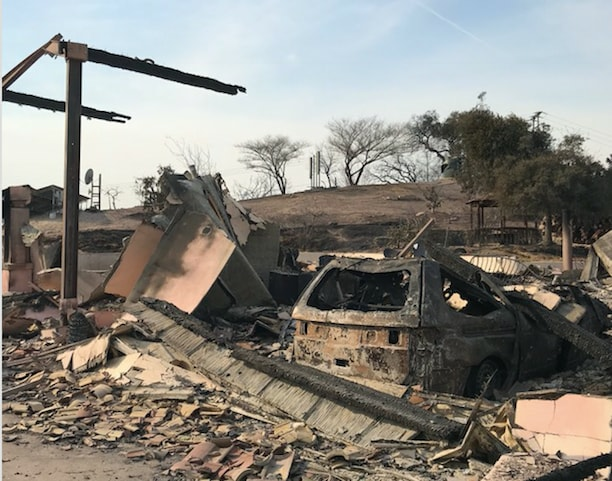 But how one of the worst fires in California history burned right up to the edge of this small, spiritual town and then stopped, leaving it virtually intact, is one of the great dramas in the tableau of ferocious natural destruction we’ve been watching. On Saturday, all along the road into Ojai, homemade signs dotted the path: “Thank you for saving our town,” one read. “Thank you to the first responders,” and just “Thank You.” And more thank yous. Not everyone was lucky. The charred remains of something called the Ojai Prayer Club stood like a wounded sentry on the mountain above the valley. The fire blew through every inch of this retreat, which up to a week ago had majestic views. But in the main, this gentle valley of ex-hippies, orange groves and spiritual seekers survived untouched. A few hundred feet from the prayer club, purple bougainvillea danced at the windy entrance of a neighboring estate. It was not a certain outcome by any means. 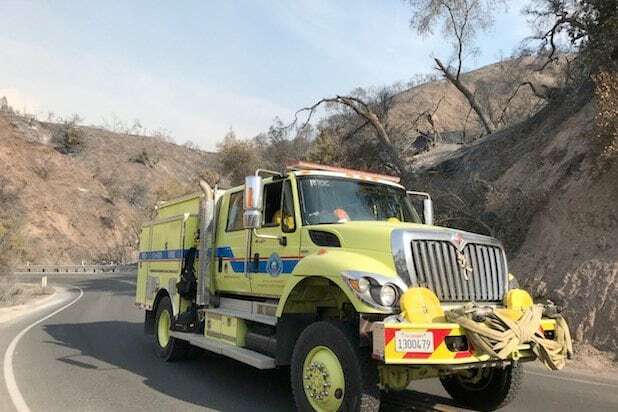 The fire began on Monday in the mountainous eastern part of town, as firefighters were busy battling another blaze that was coursing through Santa Paula, not far away. Fed by dry chaparral and an unpredictable wind, the fire raced toward Ojai, a town of 8,000 nestled in the shadow of the Topa Topa mountain range. 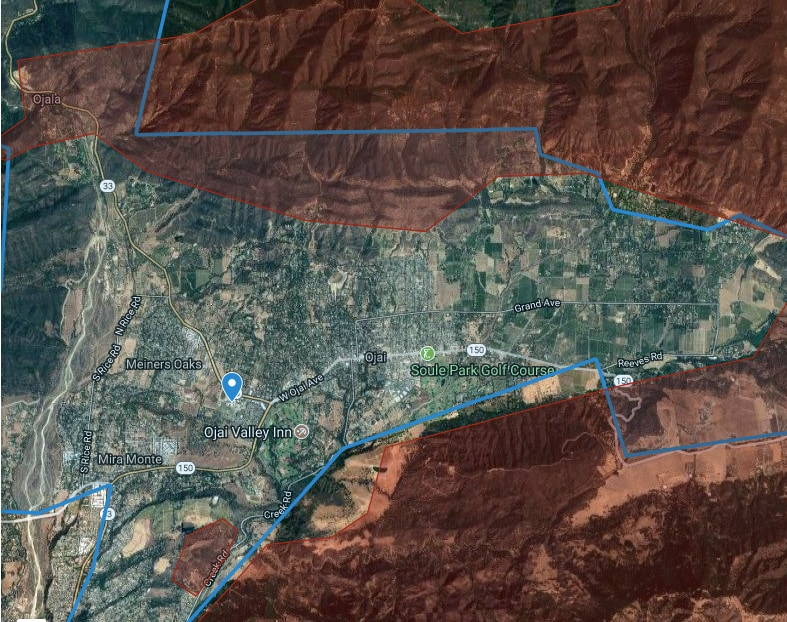 “The second fire that started in upper Ojai was a separate start. 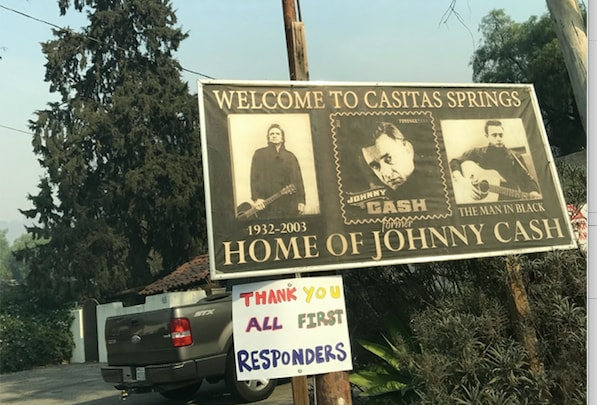 That took on its own life and then moved into Ojai proper,” explained Steve Swindle, the public information officer for Ventura County Firefighters. He is also a firefighter and was battling the blaze in Santa Paula on Monday when the Ojai fire started. For two days, the fire was zero percent contained, burning to the south, the east and the north, as residents watched and decided whether to evacuate. The embers were a serious threat, because the wind drove them ahead of the fire, and as Swindle explained, created a vacuum effect that exponentially increased the speed of the flames spreading. And for the first 12 hours, firefighters in Ojai were on their own. The authorities ordered strike teams in, and in a military-style operation, moved hundreds of men and women into place. Reinforcements flooded in by Wednesday, even as the fire and wind raged on the mountainsides. 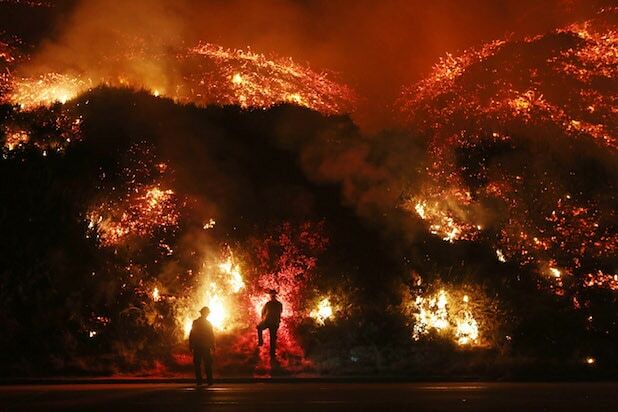 A total of 5,000 firefighters from a half-dozen states mobilized to fight the Ventura fires. In the Topa Topa neighborhood, firefighters made a stand at the base of the foothills and held back the flames. Resident Sharon Maharry said homeowners broke into sobs when they realized the fire was being beaten back. 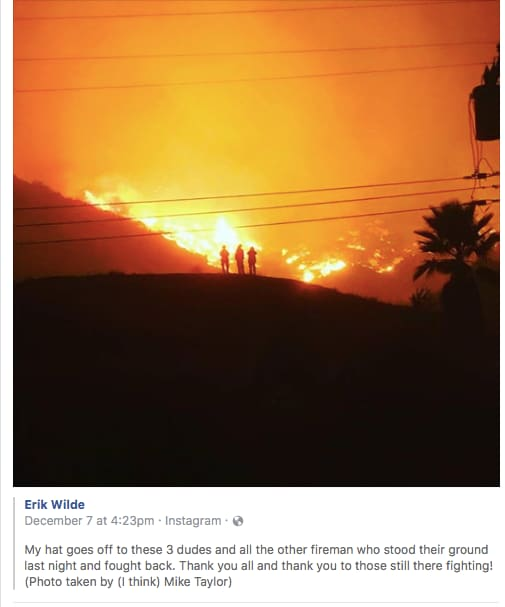 “My hat goes off to these three dudes and the other firemen who stood their ground,” a grateful resident Erik Wilde wrote on his Facebook page, under a photo of silhouetted firefighters. Thacher evacuated its 300 students ahead of the official call by the county for everyone to get out. Mulligan described “huge billowing smoke plumes” coming out of the hills and right up to the border of the campus on Thursday. “The fire crew watches them carefully, sets back fires, and uses a little water here and there. And everything turns out just fine,” he wrote. Myself, I’m here because I bought a home here a few months ago, eager for a quiet place on the weekends and holidays. Ojai is special, as most residents here will tell you. Friends are easy to come by, and so is solitude if you want that. The natural beauty is breathtaking. But it was all close to going up in smoke. Around the town on Saturday, residents shared stories of homes that burned, and how theirs miraculously survived. The haze hung heavy in the air, a few rogue fires were still burning by the side of the road and high up on a mountain ridge. In town, the evacuation notice had been lifted and air quality — yesterday “hazardous” — was just “very unhealthy.” A group called “Direct Relief” handed out face masks. Everywhere was the evidence of the raging wind and fire that encircled this town just a few days ago. The once-green mountains were stripped bald, like a brutal scalping had taken place. 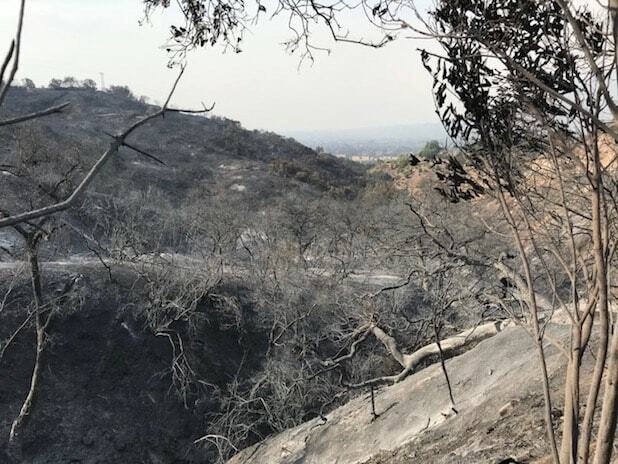 And the black soot of burned trees tiptoed right up to the 33 highway, the main artery that links the Ojai valley to the Pacific Ocean at Ventura. Once you get into Ojai, the soaring eucalyptus trees are back.